Come out and beat your demons at the inaugural HoBOOken Halloween 5k Run. The USATF-certified race course will follow along Hoboken's beautiful waterfront and finish on Pier A. Little ghosts and goblins can participate in the Scary Scurry Kids' Run. The race is produced by the Elysianettes to benefit Project Play, whose mission includes replacing old and unsafe playground equipment in Hoboken's Church Square Park. Awards will be given to the top 3 male and female finishers as well as the top 3 male and female finishers within each age group. 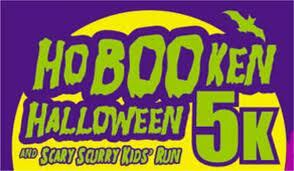 All participants in the Scary Scurry Kids' Run will receive finishers' ribbons. Awards will also be given out for the best costumes--so get creative! Super! My sons child bike will now be put to the ULTIMATE TEST!!! Mwaahahahaha.